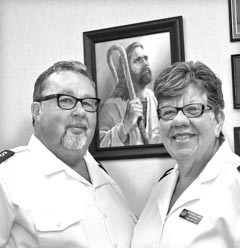 Coaster Photo – Major Carl E. Carvill and his wife Barbara, also a major in the Salvation Army, are the new officers in charge at the Salvation Army in Asbury Park. The Salvation Army in Asbury Park has a new Corps Officer and Pastor Administrator. Major Carl E. Carvill arrived at the Worship and Program Center, 605 Asbury Ave. with his wife, Barbara, also a Major in the Salvation Army, from Ithaca, New York where they held the same positions. They have been married for 36 years and have spent their entire married life in service at the Salvation Army, first in New Brunswick, which Major Carl Carvill said was their “honeymoon appointment.” It was during that time that Johnson & Johnson was building their corporate headquarters there and transforming downtown New Brunswick. Looking around Asbury Park today, Major Carvill refers to the city as “an emerging miracle” and says the changes taking place are “incredibly dynamic.” In addition to the complex on Asbury Avenue, the Army has an officer’s residence on Sunset Avenue. The long vacant former Salvation Army Retired Officers Home on Fifth Ave. is now being converted into a luxury hotel scheduled to open next year. Major Carvill described the Asbury Park Salvation Army as a significant operation with a 100-year history that at one time had the only such program on the shore. There’s a full time staff of eight in addition to hundreds of volunteers. About 80 people attend their Sunday Worship Service. They also have an Assistant Officer, Melanie DeMatteo, who recently joined the staff. Major Barbara Carvill’s primary duties involve Programming and Leadership and her husband handles the Corps Business and Outreach. Major Barbara Carvill has been in the Salvation Army for over 40 years, four years longer than her husband. The new Corps Commander is wasting no time in getting down to business. He’s forming a fresh strategic plan for Asbury Park and the 12 towns in its service area to determine the most pressing needs and find where the organization fits in. He said they will look at the social issues they can address to “make sure no one falls through the cracks of progress.” One of the most pressing needs he’ll face is finding enough volunteers to help out with the kettle collections during the upcoming holiday season. With three grown children, two of whom are also in the Salvation Army, Majors Carl and Barbara Carvill are looking forward to staying in one place. He hopes they will get a chance to finish out in New Jersey.